We put together a plan (and received the blessing from the great folks at the Fujifilm Corporation) to schedule 2 such Photography Summits, one in the spring 2017 and one in the fall of 2017. 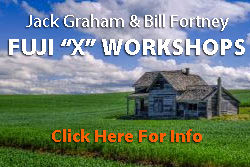 During these summits we’ll being in 2 more of Fujifilm’s “X” Photographers, great shooters and teachers to present programs and information in addition to Bill and me. That’s 4 “X” Photographers under one roof! Additionally Fujifilm has agreed to provide technical staff, folks from Fuji Headquarters (and perhaps some surprise guests) at each event. There will also be some cool give-a-ways at each summit! Each summit will have some field sessions, talks on creative and technical use of the Fujifilm “X” System as well as generally photographic topics. Image reviews are a part of this as well. You’ll be able to spend time in these formal settings as well as informal groups during our time together. This event is NOT LIMITED to only Fuji “Photographers. If you are consideration making the switch this would be a great place to find out if the Fujifilm “X” System is right for you. WE WILL SEND OUT ANOTHER UPDATE ON THIS SITE WHEN OUR WEBSITE GOES LIVE (certainly be the end of the week) AND YOU CAN DOWNLOAD THE REGISTRATION FORMS ETC! There will be two events, April 5-9 in Townsend Tennessee (Smoky Mountains) and another September 6-10 in Portland Oregon (Pacific Northwest). We have secured our “team” of “X” Photographers for each event. You’ll be pleased to see who is coming. Details also by the end of the week. Registrations for these events will be on a first come first serve basis and will fill quickly. So that’s the BIG ANNOUNCEMENT—– we are really excited and pleased to see how this project has come together so quickly and nicely.